When Nick revealed the seasonal ingredient of our first Challenge, I immediately thought of pizza. Not pepperoni or mushroom or Margherita, but … pear pizza! Over the Christmas holiday, we dined at a wine bar in Escondido, California. We ordered glasses of local red wine and no less than five pizzas for the group, including one with artichokes and olives, one with four types of cheese, and one with pears, Gorgonzola, and arugula. And I have not forgotten that pear pizza. It so closely resembles my favorite autumn salad, and I was excited to have a reason to recreate it! We started with a basic pizza crust from The Pioneer Woman. Nick whipped it up like the bread baking pro that he is, then he set it aside to rise. While Nick prepared the dough, I thinly sliced one red onion and tossed the pieces into a skillet with olive oil and butter. I let the onions caramelize for a good 30 minutes, stirring occasionally, until the natural sugars were released to yield a deep purple color and an intensely sweet flavor. 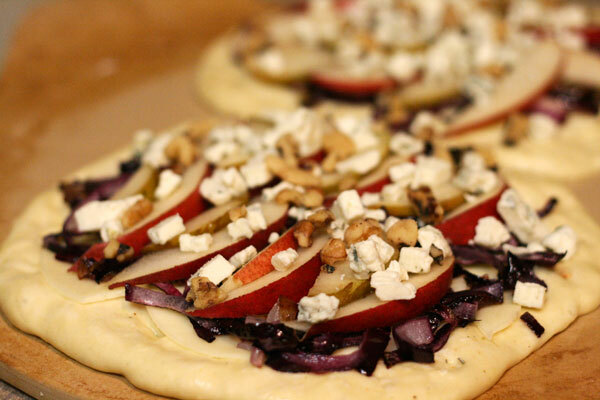 Then we built our pizzas: a layer of provolone cheese followed by the caramelized onions, slices of silky Bartlett and crunchy Seckel pears, crumbles of Gorgonzola cheese, and chopped walnuts. It looked good before it even went into the oven! And this was just the appetizer! Main course and dessert still to come. Sprinkle yeast over 1 1/2 cups warm water. Let stand for a few minutes. In a mixer fitted with a paddle attachment, combine flour and salt. With mixer running on low speed, drizzle in olive oil until combined. 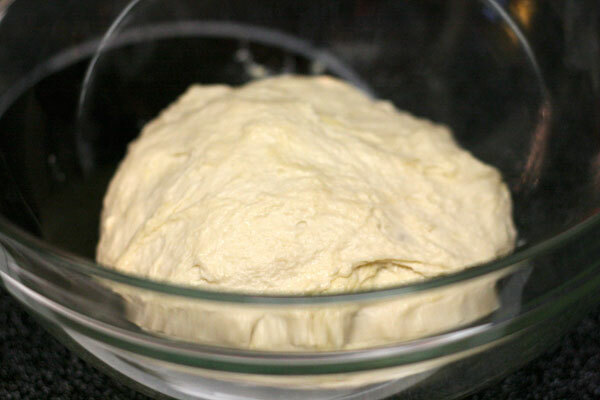 Add yeast/water mixture and mix until combined, and the dough comes together in a sticky mass. Coat a separate mixing bowl with a light drizzle of olive oil, and form the dough into a ball. Toss to coat dough in olive oil, then cover the bowl tightly with plastic wrap and set aside for 1-2 hours. Take half of the pizza dough (store the other half in the refrigerator for up to 4 days) and form it into a nice, tight ball. Roll with a rolling pin, or toss it around and pull and stretch it. When the crust is nice and thin, lay it on an oiled baking sheet or pizza pan. 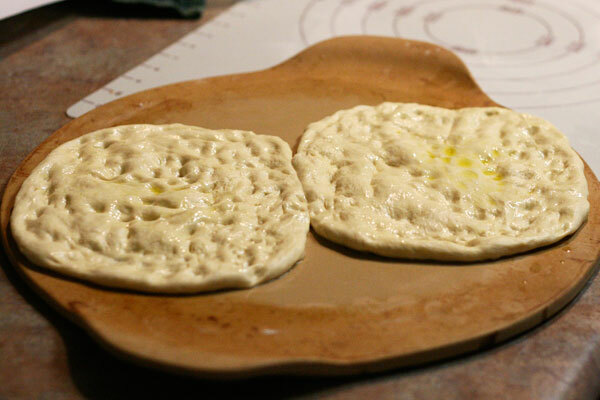 Drizzle a little more olive oil onto the dough and spread with your fingers. Sprinkle a little bit of salt on top. To caramelize onions: Add olive oil and butter to a sauté pan over medium heat. 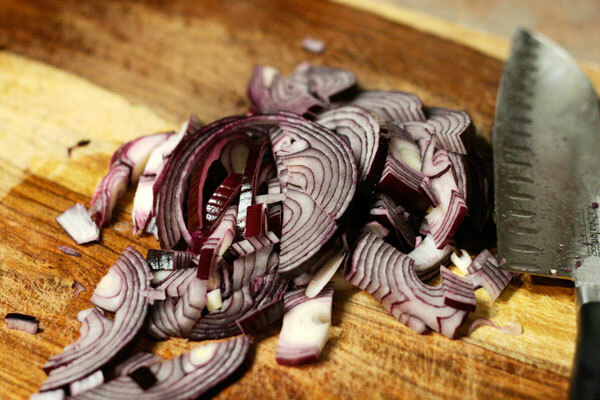 Add onions and cook for at least 30 minutes, stirring occasionally, until onions are deep brown in color and fragrant. To build pizza: Start with provolone cheese, followed by onions and pears, and sprinkle Gorgonzola cheese and walnuts on top. Bake for 15-17 minutes, or until crust is golden brown and toppings are bubbly. This look AMAZING and I can’t wait to try it!!!! You guys rock! Oh man, you have just reinvented my favorite! Yippeeeeee! Can’t wait to try this at home! 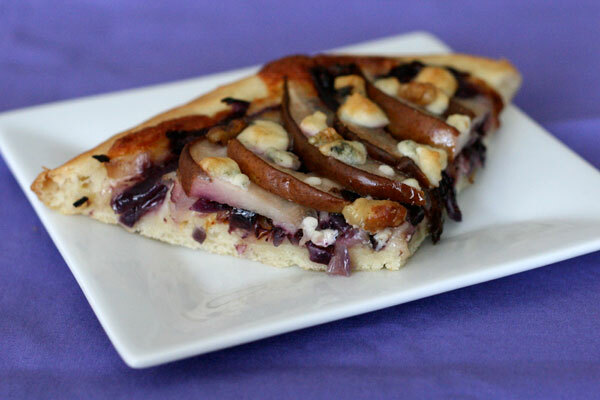 This is my first time to your blog, I saw it on tastespotting and couldn’t believe the ingredients you picked for your pizza…no lie I made pizza last night and wanted to put the EXACT ingredients as you used but boyfriend didn’t want pears on his pizza! It’s looks fantastic! Thanks for visiting and commenting! You need to convince your boyfriend that this pizza is SO worth making. Tell him you’ll make one pepperoni and one pear, and he has to have a slice of each. What’s with the boyfriend’s lack of adventure? It’s about PEARS, for goodness sake, not diesel fuel or atomic waste! Get him on board, I say. I’m all about the pears! This is AWESOME! It created dinner party heaven. Also, my husband now asks for it (which never happens because he’s very “I’ll eat whatever”). You guys rock!